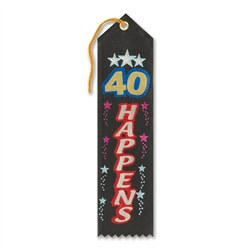 You knew it was going to happen eventually so acknowledge that you’re only getting better with age by sporting 40 Happens Ribbon on your 40th birthday. Made of black satin-finished nylon, display this eight (8) inches long and two (2) inches wide ribbon as you enter the next decade of your life. Each 40 Happens Ribbon is lively decorated with shooting stars around the border with “40 Happens” printed down the center in an array of colors to make this ribbon stand out. For added details the bottom is serrated while the top features a metal grommet with a six (6) inches loop attached. Show everyone that turning the 4-0 isn’t scary and that you’ve embraced your new decade. Additional 40th birthday accessories such as 40 It’s the Big One Deluxe Rosette Ribbon and Glittered 40 Tiara are also available.